A commonly repeated line at additive manufacturing trade shows is that 3D printing technology needs to become more accessible to the average consumer in order for the desktop industry to move forward. For many of us, FDM printing was our entry point into the maker community, so we are reluctant to be too harsh in our criticism of it. But without question, one of the main hurdles for this market is that that typical extrusion printed parts are not particularly useful in real world applications. Admitting this is uncomfortable – equivalent to announcing one’s ineptitude as a maker. Many see the ability to generate quality prints with good layer adhesion as a badge of honor. The problem is not that printed parts aren’t strong enough, it’s that the material properties are hard to predict. Print failures happen and they’re not always catastrophic or even visible. Especially in outdoor applications where components are exposed to moisture, temperature cycles, and UV bombardment, printed parts have yet to prove their adequacy. Take the example of a snowboard rack for a vehicle. While many of us trust printed parts to hold our gear up on a wall at home, holding thousands of dollars of snowboards to the roof of a car doing 80mph on the highway is another story. This is where hybrid build strategies can offer huge advantages. If we start with a solid piece of raw material (in sheet, block, or rod form) and machine the load bearing features out of this material, we know that those features of the part will have the full, predictable strength of the base material. We can then add other features that provide secondary functionality like stiffness, padding, or aesthetics. 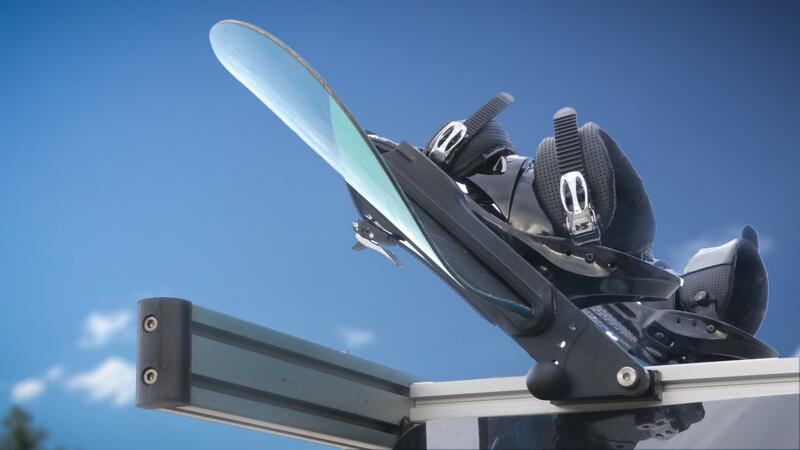 The video above shows an example hybrid build of a snowboard rack. The design is a simple slot-type rack with elastomeric padding to enclose the boards and a ratcheting binding to hold them in place. To start the build, a sheet of machine-grade ABS is clamped in a window-frame fixture to the H-Series rotary axis. This configuration is used to allow access to both sides of the sheet so that all of the features of the part can be formed in a single setup. The outline of the part is first machined using a flat end mill cutting through the sheet, but leaving strong tabs holding the part in place. A ball end mill is then used to cut the fillets and other smooth contours of the part. The elastomer chosen for the padding is an 85 shore A urethane (made by Makeshaper). This material bonds well to ABS, however in order to guarantee the integrity of the padding attachment in outdoor conditions, it is preferable to have some mechanical interference securing the connection. To accomplish this, a pattern of 4mm circular pockets is machined into the surface of the ABS. An undercut tool is then used to to cut a dovetail shape in the bottom of each of these pockets. The part is then rotated 180 degrees on the A-axis and these machining operations are completed on the second side. The tabs are then cut down to a minimum geometry necessary to hold the part in place while printing. Before starting the additive portion of the build, a manual cleaning step is necessary (a good shop vacuum and air hose make quick work of clearing the chips). To begin the padding print, the dovetail pockets are first filled using heavy over-extrusion. Because the design does not have any small feature sizes, a 0.8mm nozzle is used. This larger nozzle helps to force material into the dovetail recesses and generally allows for higher print speeds. The first layer of the padding is printed slowly to ensure a good bond to the ABS and to allow some remelting of the material filling the dovetail pockets. The upper layers of the padding are then deposited. The part is flipped, and the additive steps are repeated on the second side.